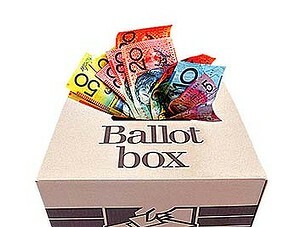 Do we want state funding for 50p per voter, or do we want to complain about bankers and unions buying influence? Last night at the Hurlingham Club in Fulham and next week at the Roundhouse in Camden the Conservative and Labour Party respectively are holding election fundraisers. These events are aimed to attract the real deep-pocketed movers and shakers (£15,000 a table at the Labour one) in order to raise enough money to pay for their election campaigns. What do these donors get in return? Well, the political parties will argue that they get nothing – but seriously? These people are handing over a large amount of cash to show a gesture of support? Not because they expect something in return? They aren’t interested in getting invited to Downing Street if the party wins? They aren’t interested in getting a mention in the honours lists of the future? They don’t want to promote their own causes or their sectional interests? Really? The scandals have lined up over the past few years – cash for access (click here) cash for peerages (click here), cash for questions (click here and here) – and they continue to be suggested whenever the unions appear to be leaning on a Labour leader or David Cameron is seen around any City fat cat or the Lib Dem’s see another donor convicted of fraud. Yet, what choice do they have at the moment. They used to get funded by party memberships – but those have fallen in the last 60 years from being in the millions for both parties to being around 100,000 – which means that if you add up the total number of party members for the Conservatives, Labour and Lib Dems you get less than the total membership of the Caravan Club. So the parties are on a fundraising roll. The Tories have raised £6.6m in the last three months – and I wonder how many of those are worried about the thought of a Labour government introducing a mansion tax on their homes? This week, Len McCluskey, the leader of the Unite union, promised further funding for Labour on top of the £12m (£8 out of every £10 raised since Ed Miliband became leader) it has already donated – but accompanied this by warnings that Miliband must “bring home the bacon for working people” and mentioned that there will be “more union-backed candidates than for a generation”. The Lib Dems meanwhile rely on Lord Palumbo (owner of the Ministry of Sound), Paul Marshall (over of Marshall Wace hedge fund) and Rumi Verjee (property developer). It can’t have escaped their notice that the Lib Dems are likely to be in coalition government again after 2015. Sir Christopher Kelly wrote a report on funding reform in which he suggested low spending limits and a cap on donations with supplements from public funding depending on membership. But the political parties are worried that they can’t explain to the electorate the need to fund them given the distrust for politicians at the moment. But the last election would have cost taxpayers 49p a person to fund, instead of the political parties having to cosy up to bankers and unions. So it is getting to the point where Ed Miliband, David Cameron and Nick Clegg need to get some courage, and make the case for state funding.